I have two major phobias that I’ve had as long as I can remember: A rational one (as phobias go, at least) and an irrational one. I have a fair number of minor ones, too, but I’m going to keep those to myself for now, lest one of you force me into a body of water I can’t see the bottom of and thrust a pill I’ve never taken before into my hands while serving me food that may have meat in it. Anyway, the rational one is of needles. Isn’t that a handy thing to be afraid of for someone with a chronic illness? The irrational one – well, it’s weird. When I was a toddler, old enough to be in a walker, and was scooting around the living room one day, my mother realized that I was chewing something. I shouldn’t have been chewing. She fished around in my mouth, found a piece of plant matter, and realized (this being the 70s, and this thus being the standard-issue house plant) I was standing next to a philodendron, which I’d apparently mistaken for an acceptable snack. I guess I had those vegetarian tendencies from the beginning. She called the poison control number, and they told her that I would be okay, but that she should make sure I didn’t eat any more philodendron. This, again, being the 70s, she had been trying to raise me without using the word “no” to scold me, and this was the first time in my life she stressed to tiny me that something was dangerous and that I must not do it. The next time we were out in the garden, she called me to her. Between the two of us was a weed, an enormous weed, with enormous leaves. She beckoned. I stood my ground. She beckoned some more. I didn’t move. Not realizing what the problem was, eventually, she picked me up and carried me bodily past the enormous weed with enormous leaves. As soon as she did, I started to scream, and ever since then, I’ve had a fear of plants with big leaves. I’m afraid that if I get too close to them, that they’ll wrap themselves around me, drag me into their clutches, and eat me. I know plants don’t eat people. I told you it was irrational. So, basically, walking through a (to others) beautiful field of sunflowers waving in the summer breeze (ack, they’re coming for me!) or finding myself suddenly face to face with a paulownia tomentosa is my greatest fear. Other examples of how this has affected my life: In high school, I always took the long way to the bus stop, because the shortcut through the woods was lined with paulownia. When I started shopping for my own groceries, I steered a wide berth around the collard greens in the produce department because even big leaves with the stalks cut off were too scary to approach. Later, an apartment complex Chimp and I lived in had bear’s breeches everywhere, and when we came to check the place out, the idea of having to run the gauntlet of those plants every day was very nearly a deal-breaker for me. And since I know you’re about to ask, no, I have never seen the musical or the film version of Little Shop of Horrors, and I have no desire to. 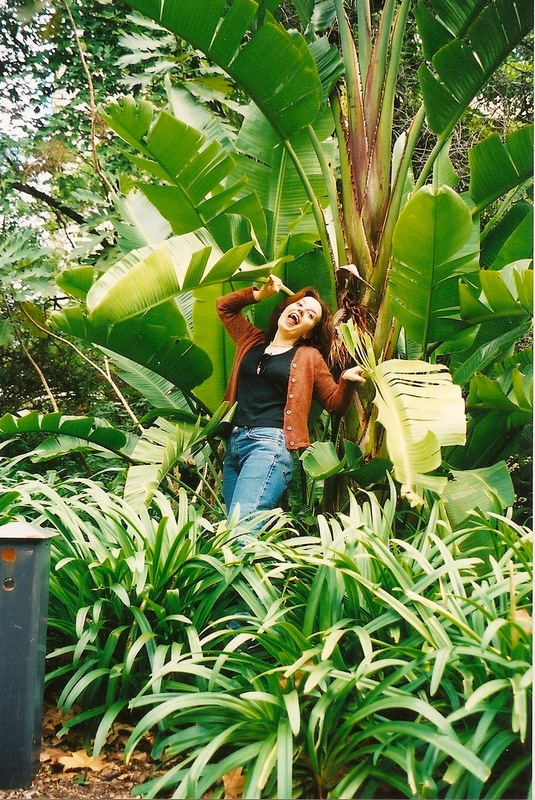 I was feeling particularly brave and not a little self-deprecating during this 2000 visit to an Australian botanical garden. The upside of this phobia, I suppose, is that it’s saved me a lot of money on tropical rainforest vacations. As for the needle phobia, well, that one’s pretty normal, but mine’s especially bad. I used to think it was just because it hurts, even though I know it doesn’t hurt that much. What it’s really about, I’ve realized over time, is about having to give up control over my body temporarily and let somebody hurt me. I know it’s going to hurt, and anticipating that makes it incredibly difficult for me to override that basic fight-or-flight response and lie there while somebody sticks me. The earliest I remember my needle phobia being a big problem for me was age 11. When I was a baby, I’d gotten my one-year MMR vaccination just a few days shy of my first birthday. Ten years later, that tiny oversight meant I was technically out of compliance with the schedule and needed a booster. Finding that out and having to get the shot was traumatic. The only thing that got me over the hump in that case was that if I didn’t get the booster, I couldn’t go to summer camp. I managed to avoid needles almost entirely from that point to about age 20, when my doctor ordered bloodwork at a routine physical. I couldn’t figure out how I was going to get through it, and in talking about it with my mom, she suggested that I visualize something comforting and peaceful, like a litter of kittens playing in the barn on our family’s farm in Indiana. Kittens! Genius. For a major ailurophile like me, nothing’s more relaxing than watching a bunch of kittens play, and adding in the family’s homeplace would make it even better, I thought. The day I’d decided on for the test, I arrived at the Kaiser lab and discovered that instead of individual exam rooms, it was a big open-plan place. And worse yet, as I walked in, several people were in the midst of getting draws. This was ten kinds of bad news, because my phobia was so bad at that point that I couldn’t bear to see tubes or syringes, much less needles or anything associated with the process – at all. I was already starting to feel a bit dizzy when the phlebotomist who was holding my lab slip tried to guide me to one of the chairs with a wide arm. So I was steered to a chaise in the center of the enormous lab. “Kittens?” she asked, as I heard her pulling the gloves on. “Well, whatever works for you.” She slipped the tourniquet around my arm and secured it, then tapped at my skin. “Kittens. Kittens kittens,” I murmured under my breath. Now she was swabbing the inside of my elbow with an alcohol wipe. “Kittens kittens kittens,” I said quietly. “Kittens in the sunshine in the barn. Happy kittens. Kittens kittens. Lots of kittens. Stripey kittens. Fuzzy kittens.” Despite the mental imagery, the unseen rustling noises at my right were causing me to tense up all over. The phlebotomist pulled my arm toward her and moved into position. I tried to resist the urge to wiggle away, and settled for leaning as far away from my arm as I could, trying to will myself to forget it was part of my body. “Kittens!” I squeaked from between gritted teeth as I felt her come toward me. I winced and braced myself. She pushed the needle into my arm. With tears streaming down my face, I opened my eyes as she taped down the cotton. “Kiiiittens. Kiiiitteeeeeeeens,” I keened, the adrenaline draining from my body. And that was when I looked up…and realized that everyone in the place was staring straight at me. This entry was posted in Life Before and tagged blood, Chimp, kittens, Mom, phobias, test. Bookmark the permalink. You and I share the phobia of needles and I’ve made it a point now to tell the people giving me shots or drawing blood that I generally have a bad reaction to them. One of the worst incidents I had was when someone I worked with in the Navy found this out on the day our command had to get our yearly flu shot (whee!). So the whole way up he was talking to me about the shot and the needles just to see what would happen, and predictably despite my best efforts to remain calm my body decided all of my blood needed to be in my legs and feet. I didn’t pass out right there, but after I got the shot I had to lie down for a while to keep concious. Ugh, not helpful, that person or your body. That sort of ribbing would have motivated me to get that person flat on the ground by application of a fist or two. My blood pressure dropped markedly after the flu shot that kicked this whole mess off too – it’s the only one I ever had, so I don’t know for sure if that vasovagal reaction was par for the course for me or the sign of something sinister. Has that ever happened to you again? The other thing I remember about the time you and I got those MMR boosters (it was at Bethesda) is that we got to pick out a little treat at the exchange afterward. You and I both got pens with clear barrels with glitter floating in them. Yours was red glitter, mine purple. I think we may have gotten McDonald’s for lunch too for being good about it. Did you know that Grandma Stewart didn’t like to have the insides of her forearms touched? She told me it made her really uncomfortable. I share the same trait, but who knows whether it’s hereditary, evolutionary, or acquired. Yes, I was not pleased and wanted to do something like that, but overall it would have been more trouble than the momentary satisfaction was worth. That is the standard reaction my body has to shots. That’s the entire reason I tell whoever is administering the shot or blood draw about my reaction it means the usually put me somewhere I can relax afterwards. I was not aware that Grandma Stewart did not like having the insides of her forearms touched. That’s not a trait I have noticed in myself ever. I think more investigation is required. Thanks for the research. I’ll be sure to put on my guard before I let my macaw sit on my forearm. It should be! Yes, apparently bears have breeches, and plants grow elephant ears. They’re scary too. Of the two, plants and needles, if I was going to have a phobic reaction by the power of suggestion (which I am very susceptible to) you’d think it’d be needles, but no, it’s plants. That picture of the paulownia is freaking me out. Hopefully in a few hours I will forget it’s even possible for someone to be afraid of plants. Reminds me again to thank my friend who drove me to all those blood draws even though she was also very needle-phobic. Sorry to have temporarily transmitted my phobia, Alison. Going through the Google results to find a good picture of the paulownia was not fun…I kept wanting to push my computer away from me to escape! Glad to hear you have a friend to get you to those tests…Chimp is great about holding my free hand and letting me dig my nails into his palm so I don’t have to yell KITTENS! at the top of my lungs. Joc, kittens are the farm on my ultimate happy thought too. I smell fresh hay and can almost feel their fuzzy little bodies in my hands. My cousin Emily also has a phobia of large leaved plants. This was particularly distressful as she lived on a heavily wooded farm. I can remember her just freezing in place during hikes in the pasture. Me, I’m afraid of the dark. I’ll think about kittens when I turn out my light tonight. No way! I’ve never met anyone with the same phobia. Tell Em she has my sympathies. Hugs (and kittens) right back at you. Thanks for the tip and the kind words, Sarah. A couple people have mentioned the Triffid thing to me – I’ll be sure to steer clear. My totally rational fear is of heights. It’s not as bad as it used to be; if I feel secure in my perch, then it doesn’t bug me as much. As for needles, I got stuck so regularly while I was pregnant that it temporarily stopped bugging me at all. I have a bit of trouble with heights too, but it’s mostly because I get terrible vertigo at height, which makes me feel like I’m going to fall. Not fun. Technically I have needle phobia too, even though I have absolutely no fear of needles. That is because the term “needle phobia” is also used to describe the vasovagal reaction from needlepricks even if there is no accompanying fear. I recently acquired a blood sugar monitor (for hypoglycemia caused by hypopituitarism caused by CFS/ME) and found out I could not read the instructions about pricking or my blood pressure crashed and I began to feeling awful. I had my husband read them and explain it to me – and now I can measure my blood sugar without any problems. I can only imagine how terrifying needle phobia accompanied by fear can be! This is a subject I plan to discuss in my next novel, which will partially be about fears. That’s very interesting that it might have a genetic side, Maija. How interesting (but unfortunate!) your reaction to needles is. I’ll be interested to see how that makes its way into your next book. Brian, who commented above, is my brother, and he also has a vasovagal reaction to that, as he mentions. I’ve already put that on my list of things to mention to Cheney at my next appointment. He’s always been interested in clues from my family health history. Oh, Jocelyn, I’m so sorry to tell you this, but you told the kittens story so very well that I had to literally laugh out loud! I’m sorry because it feels like laughing is inappropriate, making fun of you, but please don’t take it that way! I think we’re both laughing together on this one! The last time I went to Labcorp, i walked in and the place was absolutely packed – standing room only. It was spring break, and apparently every parent in the area had to get their kids’ blood tested for something. I was there three hours! Little kids take a lot of time and they were understaffed by a lot. The highlight of my visit was when a family went back – a 3 year old, 6 year old, and 11 year old girls, and a 14 year old boy. They came out and the 11 year old was looking a bit pale as her mom sat her down. They were just across from me, and I’d seen the signs before in my own daughter. As the mom was offering the girl a cup of juice, I watched as her eyes rolled up in her head and her juice went everywhere and the mom grabbed at her daughter, panic-stricken. I yelled to the desk “She’s down!” and they jumped up and came and sat her up. Within a few minutes she was talking again and they brought her icy cold washcloths for her face. It seems she was fine while having her own blood drawn, but it was afterward, while watching her little sister get her’s drawn that made her go all vaso-vagal. The mother didn’t speak terribly good English but I tried to reassure her as much as I could. The worst thing was that they were of Indian origin I think, with beautiful silky and drapy clothes, which I had been admiring, not saris, but a similar look to the material, and both mother and daughter got covered in juice. If I ever see them again at Labcorp I’m sure I’ll remember them, and will tell her to think about kittens, and not to watch! Hey, no worries, Ash, I was hoping people would be amused by it. It makes me laugh to think about it too, now that I have some distance from it. At the time, I felt a little indignant…like hey, I just achieved this major personal triumph in getting the test done, and here everyone was staring at me like I was some sort of weirdo! I mean, I am a weirdo, but I didn’t think that dealing with a needle phobia was that unusual…but admittedly the method was not the usual. Maybe the family you saw were wearing salwar kameez? They are really pretty. As for that little girl, I know the feeling, which is why I keep the paraphernalia out of my line of sight. The one exception of that is that afterward, I can sometimes bear to see a tube or two containing my blood. Once the whole thing is over, I’m proud of myself and relieved that I’ve gotten through it, and seeing a tube helps validate that. Chimp is the total opposite of me…he has no trouble with it and in fact loves to watch the whole process. Makes me feel a little queasy just thinking about it. You’re making progress – just being able to write about it is progress! Most people won’t admit to these sorts of things. I’m proud of you for working on it! Thank you for the link to the salwar kameez – that is what they were wearing, the mother’s very beautiful in a vibrant blue. The girls had jeans on but the same type of tunic top over it. This was while I was visiting my mom in Fairfax, VA – one of the suburbs of DC, with people of very many ethnicities. I just remember thinking that they were so beautiful, embroidered, and expensive-looking, and couldn’t imagine raising my tomboy girls wearing something so lovely. There was a lot of time for thinking & getting to know people who were also waiing, it took so long. I know it well – I’m from Fairfax County. 🙂 I grew up in Burke. Where does your mom live? You grew up in Burke!?! I grew up in Fairfax, went to Woodson High School. My mom lives near Fairfax Circle, off of Route 50. Although, she’s finally moving to a senior community in Houston, where my brother and his family live. She will be 85 on Sunday. I lived in Fairfax (Mantua) from age 7 through 19. I have been thru Burke & to Burke Lake, etc, many times, tho’ that’s the distant past -30 years ago. But have visited my mom many times, and wow has the area changed. We live near Front Royal now, near the Skyline Drive. Happy birthday to your mom! Ah, Mantua! Yep, know right where you were. We moved to from York, Maine to Burke in 1980, when I was four – my dad was Navy, and he was transferred there. He retired from the Navy in 1982, so I didn’t get bounced around the country like a lot of my friends did. Our house was in Burke Center, in the Oaks neighborhood between Ox and Burke Centre Parkway – it would have been new construction to you 30 years ago. When my folks divorced in ’87, my mom bought a townhouse on the other side of Burke Centre Parkway that looks over Lake Barton. I went to Lake Braddock. And my most usual run was the trail around Burke Lake! In the mid-90s, my mom moved back to Indiana (her home state), and my dad moved to Florida. I stayed in Virginia, because that’s where all my friends and my job were – at that point I was working for Fresh Fields/Whole Foods. I met Chimp in ’97, we moved in together in Arlington, and after he finished his PhD, we moved to Michigan for his first academic job in 2000. So I’ve been gone from there a dozen years at this point, and it’s changed a lot in even in that time. My greatest percentage of friends are there, still, but I wouldn’t want to move back – friends tell me that traffic has only gotten more horrendous over the years, and we could never afford the sort of house down there that we can here in SW Pennsylvania. If I were well and working, we’d probably live in Pittsburgh, but as it is, our sleepy little town where Chimp can come and go from home to campus multiple times a day to look after me is great. How lucky you are to be near Skyline Drive! I went to summer camp above Orkney Springs, and one of my aunts lives in Harrisonburg, so I’ve gone back and forth through there quite a number of times. We occasionally went antiquing along the way on some of those trips up the Valley Pike. You couldn’t have more beautiful country out your front door. I can’t believe you even know where Mantua is! What a small, small world it is! I hated it growing up – wanted to run wild in the woods, and thankfully our house backed up to Eakin Park. Spent the better part of my younger years running barefoot thru the woods there, hanging out by Eakin Creek, dreaming of living in the Shenandoah. We moved here about 11 years ago, and are just east of Front Royal, so we look down over the Shenandoah Valley. Going to see my mom in Fairfax drives me a little nuts. I hate the traffic, the constant noise of sirens or kids or traffic… a far cry from the relative peace on our mountain. I used to know everything from Vienna to Alexandria to Woodbridge like the back of my hand, but now everytime I go there’s a new traffic light, or they’ve torn something down to build something bigger, more houses or condos, etc. Give me the peace of the mountains and I’ll pass on the city or the ‘burbs! Fear of plants with big leaves? Is that philo-phobia or sun-o-phobia? But plants can’t move, but then again I have fear of heights, which comes up in strange ways. I’m worried about visiting a friend who moved to the 16th floor of a building or seeing a new TV set for a news show I watch regularly is strange, as it now overlooks Midtown from a high-up floor. Fears? And friends of mine have fear of elevators, of bridges, tunnels, subways — and one, I remember, of open fields. I have had to comfort one friend on an elevator a few times. I was afraid of needles when I was younger. We all lined up for polio shots, and we were apprehensive. Then (in 5th grade) the girl in front of me fainted dead away and hit the floor. Then I was next! Oh, fun! I’ve mostly gotten over it because nurses who draw bloods have been very gentle. After I’d had surgery a few times and needed shots of painkillers, I was apprehensive again, because they were painful, but so quickly there was relief. It’s not something I worry about, but dental work! Now there’s my nightmare, so I avoid it, which is not helpful. Denial isn’t a great tactic. Funny thing, Kathy, despite having quite a lot of it in my life, I’ve never been afraid of dental work. I wish I could send you some comfort with dentists! I credit the really good pediatric dentist who I saw for many years – and it was a good thing I had a good one too, as I was born with terrible enamel and a tiny mouth. When you got in the chair and laid back, Dr. Goldstein would always shine the light right in your eyes, getting you to automatically close them. I didn’t realize until years later that that was what he was doing. And funny thing, because of his interventions, getting shots of novocaine was the only sort of shot that didn’t really bother me as a kid! He would keep the shots out of sight, say, “little baby pinch” when he went to administer it, and that somehow worked on me despite my total phobia in other situations. Well, my dental phobias may stem from the fact that our childhood dentist did not believe in using novacaine with children — and I (and my sibling) had very deep cavities! We would cry and get so upset before appointments. It was terrible. So, this was carried forward, I’m sure. Tonight my ME/CFS was in action as I got wiped out at a friend’s and couldn’t cope that she moved some things I had to take home and I had to discuss this with another friend to go over with her what I was taking. The first friend didn’t get it nor why I wouldn’t use her bathroom as I was too tired to do so. No one gets it except those of us with this illness or people who know us so well they just see what’s happening and get it. I find myself explaining things that I don’t want to explain but if I don’t they’re not understandable to other people. Sorry to hear you had to do an impromptu education session on a night when you weren’t feeling well to begin with…but hopefully now they understand, and will be more helpful in the future. Ahhhh, memories! Large-leaf photograph by Cal! You had quite some exposure therapy during that trip to Australia, large leaves galore. I was in the Adelaide Botanical gardens recently and saw large leafed plants and thought of you! Thank you, Jocelyn. Then I had a problem with that friend telling me what to do non-stop and telling me the next day I should stop what I was doing; we were outside. I told her the next day not to tell me what to do, that people who have health problems have to feel independent, autonomous and have integrity. And if help is needed, we ask for it, notwithstanding the terrific interaction in your household. Anyway, I panicked at something earlier in the week which I thought hadn’t been done, called friends frantic, only to realize an hour later that I thought it was Wednesday, when it was Tuesday and all was well. I felt like a birdbrain. And the sleep disorder is in full force. Back to my mysteries and tv. Any day I remember what day it is is a pretty good day for me. Of course, if I forget, I can always look at one of my several pill cases…as long as I’ve remembered to take the day’s pills and whether I have or not! You are an excellent writer! Your posts are always very informative, clear, witty, grammatically correct and interesting. I can write but what I have to go through with writing everything down in my Word document as I can’t retain information, although I have ideas and a point of view, is something. Sometimes I can’t retain a piece of information for two minutes. I have to keep looking at the pages over and over again so it all sinks in. But we persevere and put one foot in front of the other. Thanks for the kind words, Kathy!